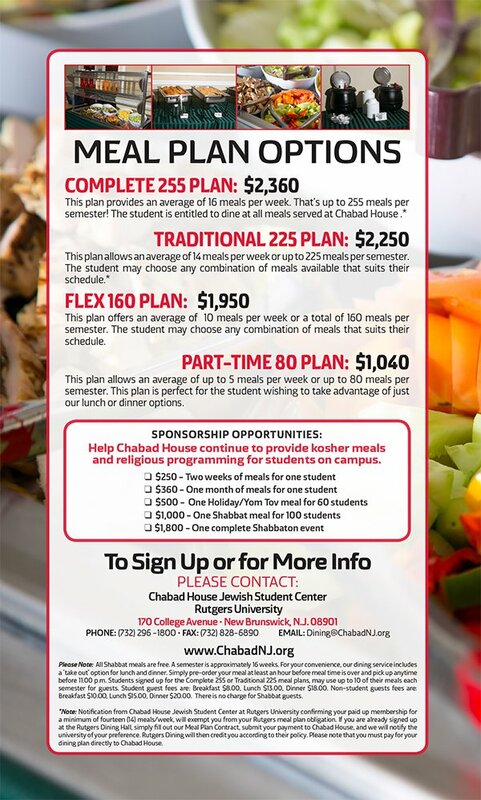 >> To register & pay online for the Chabad House Kosher Meal Plan - click here. 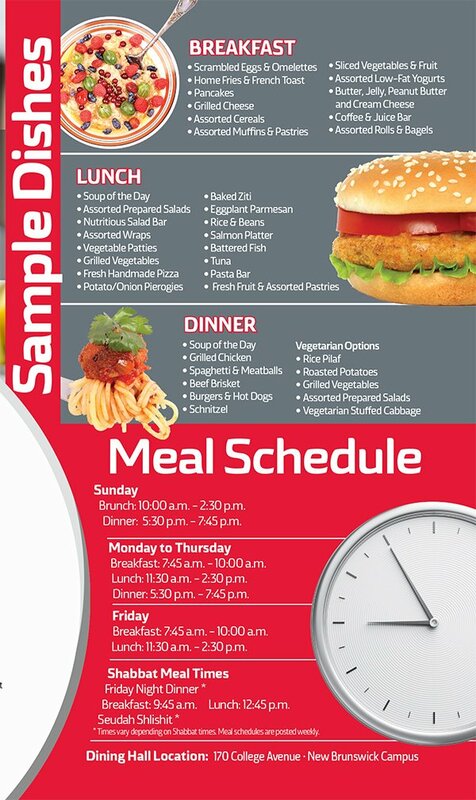 >> To download & print a meal plan registration form click here. >> To download & print a medical form for dietary accommodation click here. Would you like fries with that? The question isn’t coming through the loudspeaker at your local drive-through. It’s part of the typical weekday meal offerings at Chabad House. And the fries in question accompany a fresh hot lunch of hot dogs, hamburgers, rice, grilled vegetables, pea soup, peaches, cranberry sauce, and iced tea to wash it all down. And it’s all strictly kosher. 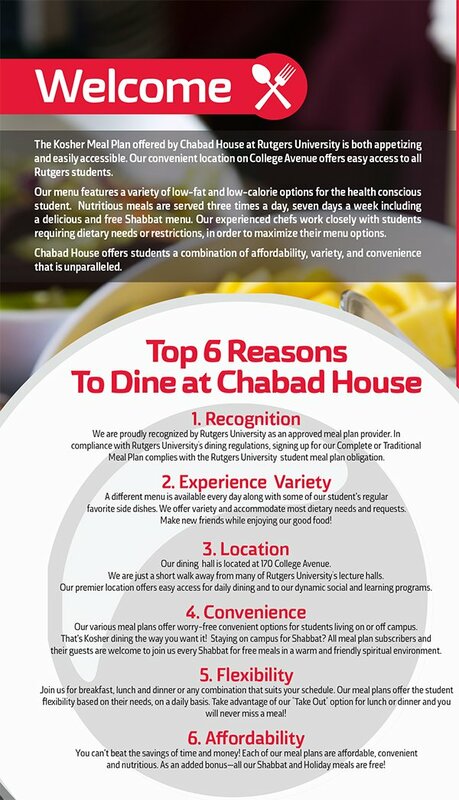 Indeed, for a college setting, kosher dining has never been more accessible – or appetizing – than at the Chabad House. All thanks to the Kosher Meal Plan. Students may sign up for a variety of options to suit their dining needs. For students only on campus during the day, there is the five-day-a-week plan. For students living in or around Chabad House, options range from five to eighteen meals per week, or in other words, the full meal plan. Meal options run the full gamut of the students’ tastes and appetites, including pizza, falafel, overstuffed hero sandwiches, pepper steak, tacos, wraps, grilled vegetables, burritos, and a variety of hot soups, fresh fruits and salads. 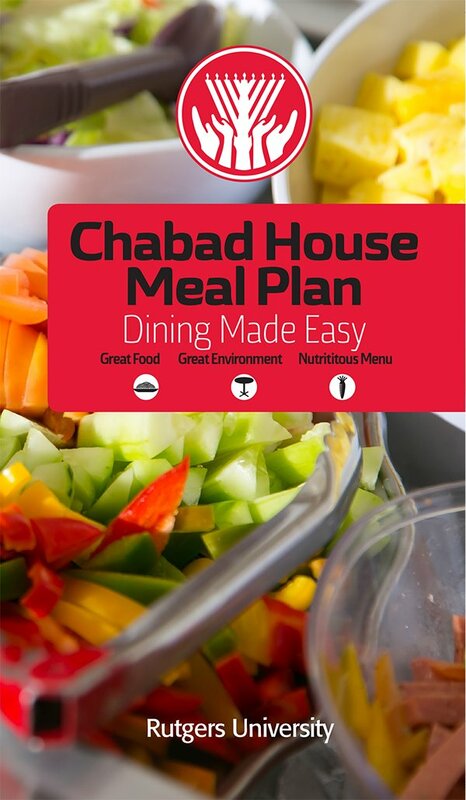 The history of the Chabad House meal plan actually traces back to Rabbi Baruch Goodman, just after he arrived to serve as the Chabad House Campus Rabbi. It was the mid-1980s. Boy George was already played out on FM radio, punk hairstyles were as common on campus as the Jets’ losing streak, and Chabad House was just beginning to gather steam. Rabbi Goodman recognized that bringing Chabad to the next level involved something that would have a direct effect in the lives of the students, something that would bring students through the doors of Chabad each and every day. Food! More precisely, good kosher food. From this line of reasoning the Chabad Meal Plan and International Food Court were first established. The meal plan served another very important function for Jewish students — friendships.